Google have just announced a major change to the way they their search works. Basically the changes are designed to ensure more current information is given priority in search results. Sounds like a good idea, particularly if they can deliver updates (as they suggest in their article) within minutes of publication on the web. So what relevance would this have for real estate online? I immediately thought of Auctions. I wonder is this is smart enough to grab upcoming Auctions only and display the relevant page data. So I went and did some simply searches a few minutes ago. 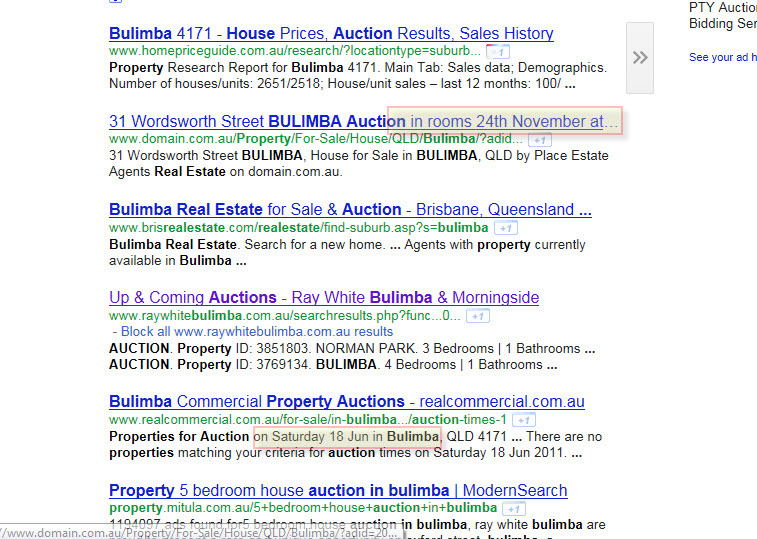 Below you can see the results from a search on keywords ‘property for auction in bulimba’. 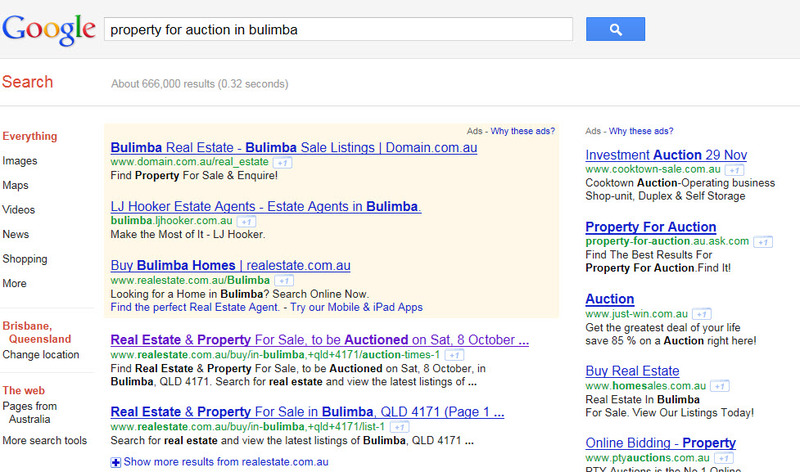 As you can see the first line item is a realestate.com.au link with a heading refering to Sat, 8 October. Not a good start. The link itself works fine. The REA site is smart enough to link me to Auctions coming this Saturday, but that is not the point here. The point is is that the Google Algorithm change was not smart enough to figure out that the data in their data (the heading and summary) was less relevant by date them other data. Going further down the results we get bettter results though. See the www.domain.com.au record for the auctiopn due on 24th November. Further down the results though you can see another entry for 18th June. So all in all what has changed? Hard to say as I did not run this search yesterday before they ran the upgrade but certainly from an Auction search results perspective not great results. A couple of interesting articles are circulating the web on the announcement that www.domain.com.au (Australia’s second most popular portal) will be accepting the upload of listings from the private seller site www.buymyplace.com.au. In this post a number of agents question why Domain would do this and how it will give a benefit to their major competitor www.realestate.com.au. See here. I know agents have a vested interest in restricting the level of enquiry a private seller can get, but do they really expect marketing websites such as Domain not to take private listings? After all Fairfax (owner of Domain) have taken and continue to take private advertisements in their Newspapers so why would the website be any different. It makes sense to have as much content on a Portal as possible so adding private sales, and increasing the depth of listings, can only help. The real question here is how does a portal such as Domain reward its loyal trade customers i.e real estate agents? In every business model a loyal repeat customer is rewarded with discounted pricing, better service or a better product. If Domain is going to take private sales then they had better make sure they look after their core customer base and reward them appropriately. I am sure all agents would be happy for Domain to take private listings if they (Domain) offered them (the Agent) something of value that a Private Seller could not obtain direct from Domain. Simon Bakes, the managing director of the REA Group has left Realestate.com.au. No doubt more will come out about this in the coming days and weeks.